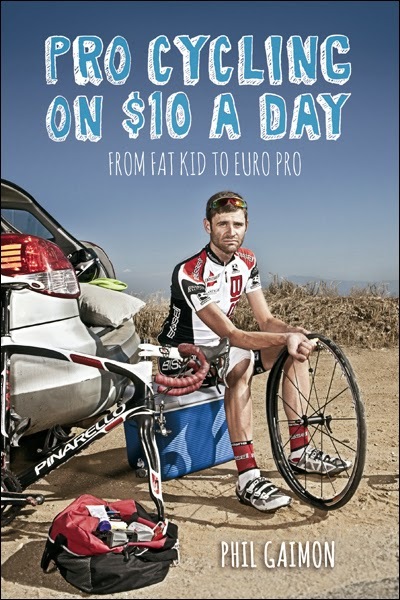 Phil Gaimon, whose palmares not only include the Redlands Classic race but also columns in some of the bigger US cycling magazines and, putting his English degree to further use, a blog. He seems to have been a particularly unlikely candidate to become a career bike racer. Born in Columbus, Ohio, he writes about how he grew up sedentary and obese in Atlanta until at 16 he obtained a used hybrid bike for transportation and within two years had dropped 40 pounds and saw his waist size melt from 36 to 30 inches. Compared to the typical European racer he had a very late start but worked hard to make time good. He joined the collegiate cycling club at university in Florida and slowly learned about race tactics. He began to move up the ranks, joining a team funded by a Bahamian billionaire (private jet! Caribbean training camp!) at the princely salary of $2000 (and two bikes) which was quadrupled for no apparent reason. The whims of team operators, billionaires and others, are a constant theme of the book but his Bahamas adventure is something he must look back to with longing considering what was to come. In 2007 he joined the second in a series of seriously underfunded teams and managed to take the white jersey for Best Young Rider (and 7th overall) at the Univest Grand Prix. 2008 and on to another team, sponsored by an organic jam company and paying the still-princely sum of $2000. 2009 saw him ride with Jelly Belly, a team that also forked over $2000 (and jelly beans). And on it goes as he recounts all the races where he seemed happy just to finish, all the terrible lodgings he had to use, all the miles he put on his unglamourous Toyota Matrix and a whole lot of disappointments, a major crash or two and plenty of broken promises. Pro cycling in the United States is an outsider sport, with on-off races, laughably amateur team management, tight-fisted sponsors and little community support. You can feel the frustration as he moves further up the US pro circuit as his abilities climb too, reaching the summit with the Bissell squad and earning $45,000 after leaving a team that reneged on paying him the miserable salary it had contracted with him. In this respect Phil Gaimon matches the old European racers, those men from Belgium or the Netherlands, who got by on grit and determination. And, in his case, many cookies. To race at the top level is the dream of every pro cyclist and in 2014, at 28, Phil Gaimon rode for World Tour team Garmin-Sharp. Sadly, the reorganization of that team means he will be returning to the US circuit again in 2015 but we can look forward to his wisecracks and positive outlook as he continues to cut a sympathetic figure in the harsh world of the pro peloton. And when he won that stage at the Tour de San Luis in Argentina (and second overall behind Giro winner Nairo Quintana) this year for Garmin-Sharp we would like to think that he was mobbed by podium girls, and not for the last time. Enjoy Phil's Thrill Ride! Looks like a good read, will have to check this one out! Interesting angle on crossing cycling with frugality, and chasing your passion!.